Caught in the day-to-day hustle and bustle, we strongly crave for an instant energy boost. Indeed, for most people, completing daily tasks with flying colors is much easier with some caffeine to keep the engines roaring. Small offices may do with a regular, home coffee maker, but with a lot of traffic, you need to step up the coffee game. To keep up with the patterns of coffee supply and demand, one has to weigh different factors. We present a comprehensive guide to set you on the right course. 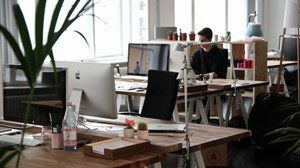 Here are the makers that will make your workday much easier and give you exactly what you need at the touch of the button. 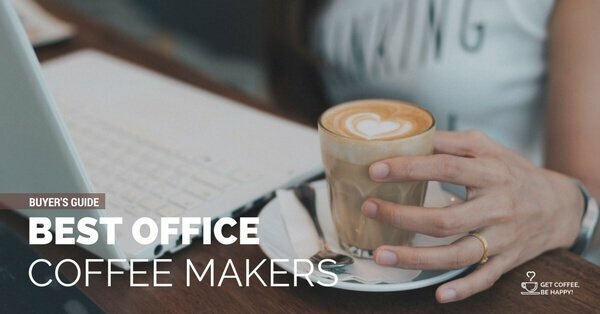 1 What are the Best Office Coffee Makers in 2018? 2.1.3 Who is this marker for? 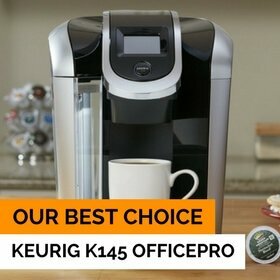 2.1.4 Where to Buy the Keurig B145 OfficePro? 2.2.3 Who should go for it? 2.2.4 Where to Buy the BUNN NHS Velocity? 2.3.3 Who should be enticed to purchase this maker? 2.3.4 Where to Buy the Mr. Coffee Optimal Brew? 4.1 Did you like my Best Office Coffee Makers Guide? What are the Best Office Coffee Makers in 2018? VIEW ON AMAZON. Click the Image! 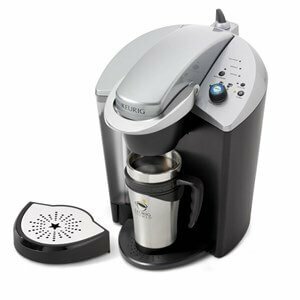 The Keurig OfficePro is a great, 1400W commercial-grade maker. Weighing only 15.2 pounds, it is an ideal solution for a small office setting. Yet, do not let the small size fool you (only 13.3’’ tall and 9.5’’ wide) because it is made from heavy-duty materials and able to withstand a high volume of use. There are 3 brewing cup size options (6, 8, and 10 oz). In addition, a removable drip tray is able to accommodate bigger, travel mugs. On top of that, it is dishwasher-safe and thus cleaning is as simple as ABC. As a bonus, you get a K-cup portion trial pack. A removable water reservoir has the capacity of 48-ounce. For instance, that is enough to brew six 8-oz. cups of coffee. Pretty good for such as small machine, isn’t it? What is more, the reservoir conveniently lifts up for filling. So, in case you want, you can pour water without actually removing it from the machine. Furthermore, users can brew one coffee is they so wish, meaning everyone in the office can satisfy their individual tastes in regards to strength and taste. Moreover, OfficePRO brews and heats in less than one minute, which means that you waste no time getting your caffeine injection. This brings us to the point that OfficePro simply oozes user-friendliness. Another proof comes in the form of an “Add Water” button, which flashes when the reservoir is low on water or improperly positioned. The controls are on top of the machine, which I find rather convenient. The lift handle is a welcome feature as it enables no-mess coffee making: The spillages of grounds are much less likely to occur, even if the machine is operated by a less-than-graceful user. Just note that upon initial use of the brewer, it must be primed. This is carried out by filling the reservoir and selecting the brew option. The K-cup is not used during this process. As for the maintenance, it is a cakewalk. Namely, the OfficePro has a descaling function. Running it is recommended at least twice a year in order to remove the calcium deposits and scale. Doing this ensures that the machine is working as advertised. Another great thing is that the brewer mounts sensors that notify you if the descaling needs to take place more often. The energy savings mode is present and there is also an Auto Off feature (after 2 hours of inactivity) that maximizes energy efficiency. To help you make up your mind, we have listed the pros and cons of using OfficePro. Who is this marker for? OfficePRO is a perfect small office companion that will save space, even on a standard-sized kitchen counter or a conference room table. It enables each person to enjoy a specific flavor of choice. Finally, being such a fast brewer, this amazing maker is a life-savior for working people who seem to be always on the go. 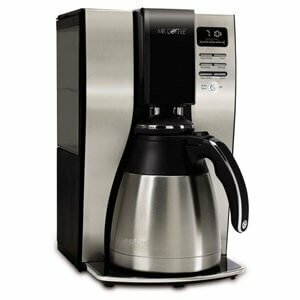 Where to Buy the Keurig B145 OfficePro? When caught up in work obligations, the need for speed tends to dictate things. It pleases us to say that BUNN NHN Velocity Brew suits the needs of a fast-paced office lifestyle perfectly. Of course, some of you may know that BUNN is well- loved for their fast machines, but this time, they really went an extra mile. The brewer may not be able to compete with other products in terms of appearance, but when it comes to the coffee-making process, it steals the show. After the one-time setup process, which plays out nice and easy, you can get a full brew of coffee in just 3 minutes. The Speed Brew Technology is the driving force behind this impressive performance. The secret is simple: The stainless steel water tank remains hot at all times. What is more, operating the machine is a no-brainer. A user simply adds the coffee to the filter basket, pours in fresh water, puts the carafe in place, and the maker does all the rest. There are no fancy options and a plethora of buttons, which is fine by me. Then again, it must be said that some users will probably find the lack of display, controls, and water-level indicator unsatisfactory. What you get, however, is simple and effective: A great machine to pump out enough coffee to keep the whole office wired. Besides, the drip-free carafe is state-of-the-art, with the proprietary lid and spout design. It keeps the mess on the cup or counter at bay. The proper extraction of the coffee is ensured via a unique, multi-stream spray head, which distributes the water evenly over ground coffee. The filter is amazing as well, facilitating the perfect blending of hot water and your favorite coffee. The result, of course, is a full-flavored, delicious coffee. Finally, cleaning the machine is straightforward and it does not take much time. Despite having some plastic parts, it is built to last and comes with a three-year warranty. Anyone in need of a quick, on-demand coffee in the office will find this machine to be a blast to use. Yielding incredible taste every time, Velocity Brew will satisfy even the work-pressed coffee aficionados out there. And taking into account into high durability, it will not work for you only as an eager sprinter, but as a reliable marathon runner as well. Where to Buy the BUNN NHS Velocity? Last but not the least, it is time to take a look at one highly-practical and affordable model. Optimal Brew is worth your attention and possibly money because it is packed with features. It is a sound choice in case you seek good value for a relatively small amount of money. A removable water reservoir is easy to use and fill. It is one of the main reasons why Optimal Brew is a joy to use. The water is poured on top of the unit, though, which may not be to everyone’s liking. Also, one thing that bugged me was that purging is not as fast as I would like. Despite some flaws, Optimal Brew is still a rock-solid machine. Take, for example, a thermal carafe, which is double-walled, stainless steel marvel capable of maintaining optimal temperature and full flavor. This kind of feature is almost impossible to come by in this price range. Also, Mr. Coffee’s staple product uses a high brewing temperature of up to 205 degrees Celsius, making sure you receive nothing short of a great-tasting coffee. The good news is also that it is possible to prepare 10 cups of coffee in under 7 minutes. And do not fret if the first batch does not taste exactly right: Some users experience this problem, but it can be overcome by cleaning the machine. Features like “Delay Brew” just make my day. As the name suggests, a user can schedule brew time ahead and get the cup of coffee instantly. There is also a “Freshness Timer”, which keeps a watchful eye on your coffee after brewing. A Grab-A-Cup Auto Pause activates in case you want to have your cup before the brewing cycle completes. All in all, these handy options take all the guesswork out of the coffee-making process. The Gold Tone permanent filter, on the other hand, eliminates paper filter waste and cuts the costs of satisfying your coffee addiction. At last, the Water Filtration Disk is included in the package and it allows users to deal with chlorine and impurities from water. You are even told when the best time to clean the machine is. Here are some aspects to factor in before taking a plunge. Who should be enticed to purchase this maker? Coffee drinkers who crave for hotter and faster coffee will be over the moon with this one. You will never run out of steam again in the office and work your fingers to the bone if need be. It’s just that those who want barista-style coffee might need to lower the expectations because this machine cannot exactly go toe-to-toe with the pricier, top-notch models in the market. Where to Buy the Mr. Coffee Optimal Brew? Good-tasting coffee in an office is not optional but absolutely required. To make it happen, you need a proper maker. Well, all of the featured machines are reliable, easy to use and deliver excellent taste. One of the main things to consider is how many people will use the machine. Consequently, the speed of brewing has a key role to play as well as the capacity of the carafe. But, which one of the presented makers fits your bill perfectly? For us, the Keurig has an edge over the two other coffee flagships. Beyond everything else, it performs incredibly well in all categories, including performance, functionality, coffee taste, and the maintenance. So, there is no time to hesitate. Brew up tasty pots in a flash and get ready to attack the workload without mercy, with strong winds in your sales. No office will ever feel the same with these exceptional makers that stir your senses and get you really going. Good-tasting coffee in an office is not optional but absolutely required. 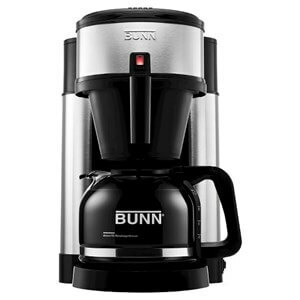 Choose any from our list of the Best Office Coffee Makers! 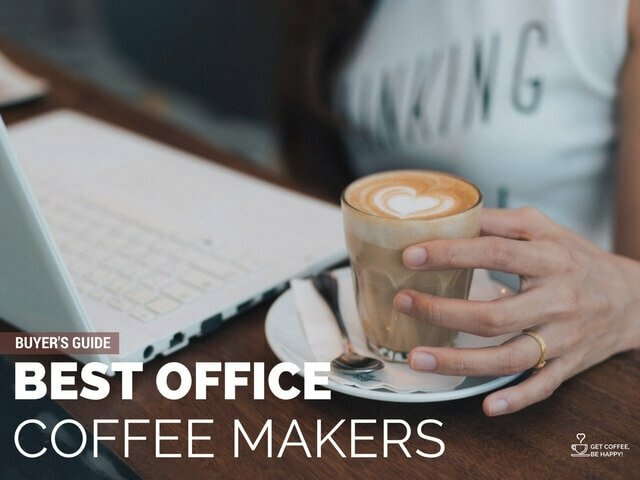 Did you like my Best Office Coffee Makers Guide?